RRB ALP Result 2018-19 For 2nd Stage CBT Will Declared Soon on 6th April 2019, Check Now at Official Website : rrb.gov.in. 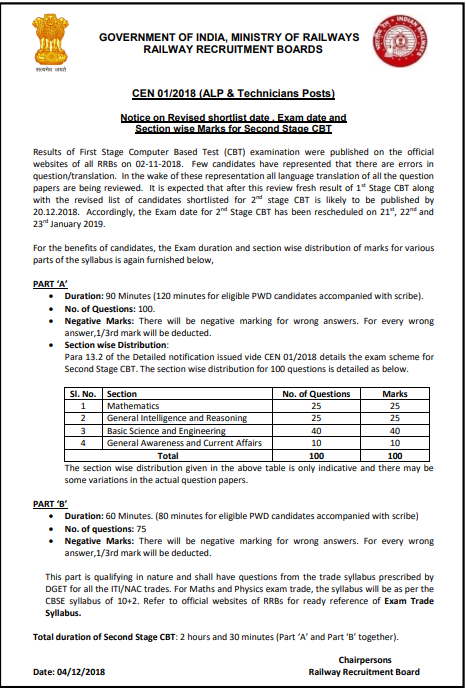 The RRB ALP CBT 2 Result 2018-2019 announced on 6th April 2019. The RRB ALP Exam was conducted on 21st, 22nd, and 23rd January 2019.The candidates will be able to check their result online at the official website of 21 RRBs. The result RRB ALP CBT 2 is released in 2 forms, merit list, and scorecard. The merit list comprises of roll no. of the candidates who have qualified the exam and are eligible for the next round. Whereas, the scorecard is made available to all the candidates who have appeared for the CBT Stage 2 exam. To access the login, candidates will have to enter user id and date of birth. Then, click on the ‘login’ button. Lastly, the result RRB ALP 2018-19 will be displayed on the dashboard. RRB ALP CBT 1 Revised Result – Check Official Notice Now! RRB ALP Result 2018: RRB had released the ALP CBT 1 result. The Railways RRB Recruitment for Assistant Loco Pilot & Technicians was released a couple months back. A total of 64,371 vacancies are to be filled. The RRB CBT 1 exam was conducted 9th August 2018 to 31st August 2018 in multiple shifts & lakhs of students appeared for the exam & ALP CBT 1 result was thus declared. However, few candidates had represented that there are errors in question/translation. In the wake of this representation, all language translation of all the question papers are being reviewed & the revised result will finally be declared. Read further to know more about RRB ALP CBT 1 Result Status & much more. It is expected that after this review RRB CBT 1 result along with the revised list of candidates shortlisted for 2nd stage CBT is likely to be published by 20th December 2018. Also, RRB ALP CBT 2 exam date is postponed and it has been rescheduled to 21st, 22nd and 23rd January 2019. RRB ALP Result 2018: The Railway Recruitment Board (RRB) conducts the RRB ALP exam every year to recruit Assistant Loco Pilots (ALP) across the country. This year, there is opening for 26,502 posts of Assistant Loco Pilot across India. Around 36 lakh candidates have appeared for the 1st Stage CBT this year, which was conducted in August 2018. RRB has released the RRB ALP Result for the 1st Stage CBT on 2nd November 2018. Applicants can download their result from the official website of RRB or the official website of the RRB Region they applied for. The last date to check the RRB ALP Result is 11th December 2018. Applicants who clear the 1st Stage CBT will be eligible to appear for the 2nd Stage CBT. As per RRB ALP Notification, applicants 15 times the number of vacancies were to be shortlisted for 2nd Stage CBT, which would be around 9.5 lakhs. However, only 5,88,604 applicants have been shortlisted for 2nd Stage CBT. Note that the second stage CBT will be conducted from 12th to 14th December 2018. As you know, the 2nd Stage CBT has a test of relevant trade (Industrial Painter, Machinist, Book Binder, Fitter, etc.). The applicants can check the date for RRB ALP Result announcement 2018 from the table below. Step 2 Click on the link provided to check RRB ALP Result, under RRB ALP/Technician Recruitment 2018 CEN 01/2018. Step 6 Take a printout of your RRB ALP Result for future reference.